There are numerous Sue Ryder charity shops throughout the UK, but few shoppers know much about their founder. She was a determined and philanthropic woman who created homes for those who were damaged by trauma and injury experienced during WW2. She made a huge and positive difference to many thousands. Tessa West trained as a teacher, though soon found herself working in prisons rather than schools. A Winston Churchill Travel Fellowship enabled her to study prisons in Scandinavia. She later served as an Independent Member of the Parole Board. In retirement she has focused on writing, both fiction and non-fiction. Lady Ryder created homes for those who were damaged by trauma and injury experienced during the Second World War. A woman who lived by a simple motto: “Do what you can for the person in front of you”. That’s really worth remembering. Well researched. Well written. A contribution to scholarship and a pleasure for the general reader. Having lived near a Sue Ryder charity shop for many years, I knew very little about the woman behind the name until I read Tessa West’s excellent account of Sue Ryder’s life. Tessa West invites the reader to be alongside her as she investigates the life of Sue Ryder. I felt that I not only got close to Sue Ryder but also that I was part of the process of enquiry. This added an extra dimension – learning more about Sue Ryder’s best known achievements but also about the many ins and outs of an unusual life. It was a life of my times, which added more interest. And I liked the fact that when, occasionally, Sue Ryder almost slipped from view, the author told us why this was. Sue Ryder felt real and I trusted the account. Good research, thoughtful writing. Quite a story. Good to know that the stores are carrying on her work. I appreciated the large number of photos in the Book, they were all very interesting and well chosen. The book was very informative, especially to know that Sue Ryder had spent time in Audley End House with the SOE Poles during WWII. Sue Ryder was a most brave woman and I’m glad her legacy lives on in so many Sue Ryder shops carrying on her good work for those in need. A book I couldn’t put down once I’d started to read! This very well-researched book about Sue Ryder by Tessa West has a large number of merits, and it is beneficial not only for the British and the Polish to read it: it is very important internationally, and here is how I see it. FIRSTLY, I am Ukrainian, and I must confess, I have gained a very new look at Poland and Polish people. Catholicism has been opposed to Orthodoxy, and Poland used to occupy parts of the Orthodox Ukraine a long time ago about which not all Ukrainians were happy. Thus, my inherited stereotypes of Poland and Poles have been very controversial. I believe I have gained a lot from Tessa West’s book by rediscovering these people ‘from the inside’ of their tragedy and faith which helped them to edure the atrocities of WW2. SECONDLY, reading about Sue’s personality also seems most unusual to me, a Ukrainian born in the Soviet Union. Sue would have been impossible in the Soviet Union after the Revolution of 1917. The privileged classes were completely abolished here during the Revolution: some were killed, some managed to escape. So, such philanthropists used to exist only in the times of the pre-revolutionary Russian Empire. Even rebuilding the country after World War 2 was all centralized and it was the business of the state structure, individuals didn’t count much (even if there were special funds to help those in need – they were all state funds! ); though, certainly there were a lot of people who gave all their lives to reviving the ruined country – very few names are mentioned today, most of them remain unknown to the world, some are remembered locally. It is very different with Sue Ryder and Leonard Chesire. A very different relationship between a person and the state, and the world… They became real examples of what the privileged are supposed to do for those in need. They renounced many the joys of life they could have had to give a lot of opportunities to those suffering. THIRDLY, what strikes me in between the lines of the book is the scale of suffering – I have read and heard much from my older relatives about the scale of in-the-war and after-the-war suffering in Ukraine and Russia, including femine, diseases, deaths, loss of relatives and homes. This suffering was enormous. I have heard much about German concentration camps. However, the scale of suffering in Europe sounds much more painful than I used to think about it. This book gives a real insight into the problem. ONE MORE REASON why this book is important internationally: today, younger generations rightly despise former Soviet Union propaganda. However, there is a great danger when the Soviet stories about the Nazis’ atrocities seem exagerated to the young as they think them to be part of Soviet propaganda. These stories HAVE NEVER BEEN PART OF PROPAGANDA, they have been true about the whole of Europe. The young should read this book to be timely explained: though distanced in history, nazism is BY NO MEANS romantic. I recommend everyone to read this important book by Tessa West! An extraordinary life, in partnership with an e trairdinary man, between them creating a caring environment for survivors of all sorts of wartime atrocities. A very complex person with a rigorous agenda to follow her own and her church’s beliefs and values. An authentic 20th century heroine. I am the author of this book. My intention is to tell people about Sue Ryder, a woman whose name could slip away and be known merely as someone who created charity shops rather than for the amazing work she carried out for people who had suffered from illness, war, displacement and other serious and painful misfortunes. My research lasted over two years – two years which were full of interest and diversity. I visited Warsaw, Audley End, Thurlow and Cavendish, all of which played a part in Sue Ryder’s life. It was one adventure to research, and another to actually write down what I found. This is the first biography of Lady Ryder (although she wrote two autobiographies) and I am pleased that it includes some new information. I hope that a wide range of people will enjoy it and find it interesting. A very well written and extensively researched book about a person whose name is familiar but about whom I knew very little. Excellent illustrations and a most interesting read. A really interesting biography. Having visited the mother of a close friend in the Cavendish Sue Ryder home, I was drawn to find out more about the home and the woman who started it all. I didn’t realise, for example, that the Cavendish home began as a refuge for concentration camp survivors. The book was fascinating, so much more than I’d expected. A fascinating book, well researched and extremely well written. The author has taken a lot of trouble to give us intricate and fascinating detail about Sue Ryder’s inspirational work and life. May I suggest that copies of this book be available in every Sue Ryder shop for the interested shopper to buy? It is so interesting to learn more about someone whose name one has known for many years. A worthy tribute to Sue Ryder – and excellently written. Everyone knows the name Sue Ryder and are familiar with her charity shops which can be found in nearly every town center across the UK. But very few people know about the woman herself and Tessa West shines a light on her and the amazing work she did rehabilitating people who were effected by WWII. A well researched book with large number of interesting photos too. An excellent read. An amazing and quite unforgettable read. A well written biography with many illustrations. From visits to the UK Sue Ryder Charity Shops are familiar to me, though I hadn´t realized that there were so many. The work Sue Ryder did in Germany added an interesting, new aspect of German history to me and makes the book worth reading not only in the UK. Incredibly interesting to learn so much more about Sue Ryder – a household name whom I now realise I knew very little about. What an amazing woman and a fascinating read. A very readable book about an amazing but enigmatic woman. I was familiar with the charity shops, but I never knew about Sue Ryder’s international work or how far-reaching her efforts were in the UK. This is a captivating biography about a remarkable woman. Of all the things I like about this book the most important is that it tells of Sue Ryder’s single focused aim of relieving suffering. Very well done, Tessa, and I look forward to reading this new book. The compassion that Sue Ryder had for those we have more or less forgotten as we commemorate the World Wars is inspirational. And her lifetime of acts to follow through on that compassion was exceptional. How is it that her name means so little to us now, apart from the charity shops? Let’s hope that Tessa West’s work on her biography provides every Sue Ryder shop with an important story to tell. They not only help with current problems, but are a living memorial to a remarkable woman. Copies of the book should be next to every till. Thoroughly researched, well written and a significant contribution to the memory of a wonderful person. Tessa West always does her homework and is a thorough researcher. This is a worthy book. A biography of Sue Ryder was long overdue. Congratulations and Thanks to the author for a comprehensive and intriguing study. justice. This life is fascinating and moving: Sue Ryder’s single-mindedness and strengths vividly portrayed. Although I am local and have visited a Sue Ryder home, there is so much well-researched information in this book of which I was unaware. Beautifully put together and very readable. A very well researched book & interesting to read.I was surprised at how many Sue Ryder shops there are. A portrait of the single minded determination that lies behind every Sue Ryder shop. Fascinating! Excellent, Tess. May I second the suggestion that copies of the book are available in Sue Ryder shops for people to buy? I am a bit involved in the Sue Ryuder charity as it is today, but I knew very little about its remarkable founder. I found it extremely interesting. What a complex woman. I am a little involved in the Sue Ryder charity as it is today but knew very ;title about its remarkable founder. I found it extremely interesting. What a complex woman ! Very well written and informative about Sue Ryder, an amazing woman! For years I have passed by the shops and the Sue Ryder Home in Cavendish. It is fascinating to now read about the intriguing lady whose life is so fascinating and who instigated these homes. Having known Sue Ryder and worked for her I can say this book is extreemly well researched and presented. Incredibly detailed and carefully researched. A very interesting read about an inspirational woman, whose dedicated work continues to support many, both in our local area and around the country. We are attending a funeral tomorrow where the donations will be for Sue Ryder. I soaked up the extensive research and photos – increasing my awareness of this compassionate Polish woman. Felt a tickle of connection that she lived in the same corner of England as myself (also an ‘immigrant’), and that her work continues as a lasting legacy in the UK. This book also made me think about the value of European connections in general and how they can benefit all of us. Well done Tessa West. I found this book fascinating and couldn’t put it down. I had no idea that Sue Ryder had any connection with Poland. In fact I have given this book as a gift to several of my friends who were thrilled to receive it. I have read a number of Tessa’s books and they are all meticulously researched and interesting. I plan to visit the graveyard at Cavendish one day to see where Sue Ryder and some of her Polish friends are buried. I have known Tessa for many years and know her work well. She is well read and treats all her books with tenacious research and knowledge. I am so pleased to see that this wonderful woman is now given due respect and honour by a very worthy author. Well done Tessa. The book is very thoroughly researched and relies on many sources, including Lady Ryder’s own two but much earlier autobiographies. That so much material has been gathered is tribute to the author given the unusual and unexplained clause in Ryder’s will demanding that all personal papers were to be destroyed immediately after her death. The book is easy to read and enjoyable, and throws a great deal of light on the complicated, yet driven, life of a great philanthropist. It leaves the reader with plenty to ponder. Sue Ryder’s remarkable life, and considerable achievements has been given greater clarity as a result of this well written book, by Tessa West. A very interesting book that highlights much research, and which is extremely well written. Tessa West is an asset to the literary world. So well researched and an absorbing read with new information about an inspiring woman. A fantastic read. Extremely interesting. I was delighted to come across Tessa West’s fascinating biography of Lady Ryder. My mother was Lady Ryder’s friend and confidante and also her official translator, translating her autobiography into Polish. Sadly the book never went into print in Poland due to the extreme paper shortage at the time. Lady Ryder was totally selfless; she worked tirelessly (on virtually no sleep!) and devoted her life to help others. In her well-researched book, Tessa has done a magnificent job providing Lady Ryder with the recognition and acknowledgement she so very much deserved. I do hope she wins the prize! A very revealing biography, despite the difficulties of access to hitherto unreleased material. All the same, painstakingly researched. My own recent connections with Poland made this book of particular interest. Tessa West is thoroughly involved with her subject and her accessible narrative succeeds in unravelling for the reader an otherwise very private personality. Tessa West is an accomplished biographer and treats her subject with respect and honesty with her diligently researched life story of this amazing woman. Surely it should be on display in every one of the Sue Ryder charity shops. ? An excellent read. This book is extremely well researched, very informative and very readable. I was struck by its honesty. It charts Sue Ryder’s life from 1923, born into a very privileged background in Leeds, to her very sad death in 2000. She was educated at Benendon school for Girls, but left when she was 16, determined to contribute to the war effort. She became a FANY and was posted to Audley End where she worked with the Polish Section of the Special Operations Executive, the Cichociemni, the Silent Unseen. Her special link with Poland lasted all her life. She was a woman with a mission. I was struck by her determination and energy from such a young age and her powers of leadership. Obviously not always an easy woman to work with, the book displays her energy and incredible determination to do all in her power to relieve the suffering of people distress. Highly recommended. I really enjoyed the biographer and Tessa West has written a fascinating book about Sue Ryder. I read the book with great interest as I lived in the ‘Displaced Persons’ Camps in Germany and my father worked with Sue Ryder identifying people who needed help. Tessa has captured the character and dedication of Sue, very well. Sue Ryder has helped many Concentration Camp Victims of various nations, living in West Germany, by taking them on holidays to the UK or even arranging for them to live in the UK. All this is well covered in the book. 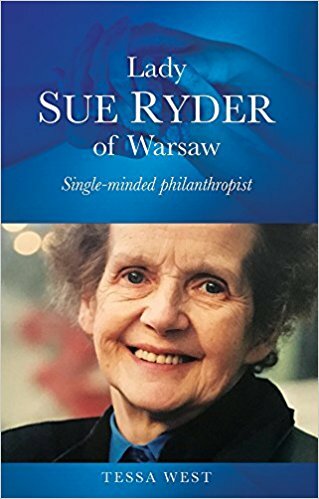 This is a very well researched book and it should be translated into Polish as it is there were people known very little about this courageous, focused and very generous Lady that Sue Ryder was. For many years, the only way of getting to know who Sue Ryder was, has been through the daunting task of tackling her own substantial autobiographical works. this book provides a well researched, up to date and accessible account of Lady Ryder, bringing to life and giving substance to the remarkable lady who inspired the well known charity shops and the hospices which provide such high quality care to patients and their families. Tessa’s success in gathering together a wide range of sources, including personal memoirs of those who had contact with SR, anecdote and the inhouse magazine articles of the Sue Ryder organisation, gives a vivid picture of the woman, a sense of her energy and indomitable spirit in the face of obstacles which would have defeated most others. Whilst recognising that much material remains at present inaccessible in Poland, by setting out the range of sources and illustrating their potential, Tessa has made a significant contribution which can be built on by future researchers on social aspects of the post war period of reconstruction in Europe. Lady Ryder deserves to be much better known for the woman she was, rather than just as a name on a shop front or at the hospice door. This book helps in that important and worthwhile task. A few years after Lady Ryder was forced out of her charity I acted as solicitor to the residents of one of her care homes facing closure. I was told, by a resident that had spent her working life devoted to Lady Ryder’s cause, that she would spin in her grave if she knew what was happening. That was a time of great change in the arena of care which turned what had been the outpouring of love into a business. The world is poorer for it. Tessa West has captured the spirit and drive of a very unusual person. She has not deified her and, in her restraint, has allowed Lady Ryder’s faith and compassion to breathe through her work. The book remained interesting from the first page to the last. I applaud the hard work put into this book and the service that Tessa has done for all of us in writing it. Well done. I’m pleased that people are enjoying my book. Since writing it, I have learned more about Sue Ryder’s life: an excellent outcome. I really loved this biographer and I think, that Tessa West has written an amazing book about Sue Ryder. This is a very important book!!! An interesting and wonderful book! I opened a book and it was just as though it was a letter from an old friend. A thoughtful and beautiful description of an amazing life of philanthropy. I read it in just a few sessions, and at each page turn a fond memory of Sue Ryder and her organsation emerged. A thoroughly lovely book which will be an eye opener to those who only know the shops and the bric a brac. Thank you Tessa for this. Perfect book for women. I really like this book. After the war was over, Tessa Ryder volunteered to do relief work, including some in Poland. it’s worthy of respect! I advise everyone to this book! Sue Ryder’s work started during WWII, helping people displaced from their homes as a result of war. After the war she widened the scope of her work, supporting people with complex needs and life-threatening conditions across the UK and internationally. When she died on 2nd November 2000, she left behind a legacy of charities around the world, including ours, who continue to provide care based on her principles: compassion and the relief of suffering. To my mind, Sue Ryder was an amazing woman who brought kindness and support to this world. Amazing book by amazing author! I’m astonished by how good it is written. The amount of work and research impresses me a lot. You simply cannot hide such a great talent in writing and telling story. Both Sue Ryder and Tessa West are wonderful people! Go and read this book if you still hadn’t! It was a great pleasure for me to read this book. I got carried away with this story. It is very affecting. To be honest, nice to know that there are such people in the world. I will recommend this cool book to my friends! It is fantastic story about FANTASTIC woman. I’d like to read it again and again for admiration some kind of good deeds. This book is awesome exemple of good biography very good and kind human. After reading this book, you want to get better and better. I advise you to read it now. I was fortunate to get to know the brief story about Sue Ryder. In this biography Tessa West captures her strengths and weaknesses as well as leaving us in no doubt about the many obstacles this great lady had to overcome to help so many individuals. The book is very easy to read, I had read it from cover to cover. The great amount of details, lifelike style and such insipational mood make this book perfect, wonderful and sincere. Read it. You won’t regret! This book is unique because it encourage you to become better. It is like a good friend, the one that appeal to you, speak to you in your own language and make you understand people who had suffered from illnesses. This is an important book about an important and remarkable woman spanning great historical events. of Warsaw. Sue Ryder reminds us of the best of British spirit, self sacrifice, service, care. This book covers so much.